Face washes are the basic and the most used product in every women’s skin care kit. Having combination skin with oily T-zone, I wash my face multiple times a day and run out of face washes quickly. So when Lisha sent me three new face washes from Dr.Batra’s which were launched recently, I was delighted. So, today I will be reviewing the Dr.Batra’s Acne Clear Face Wash. Read on to know whether it works on acne and pimples. 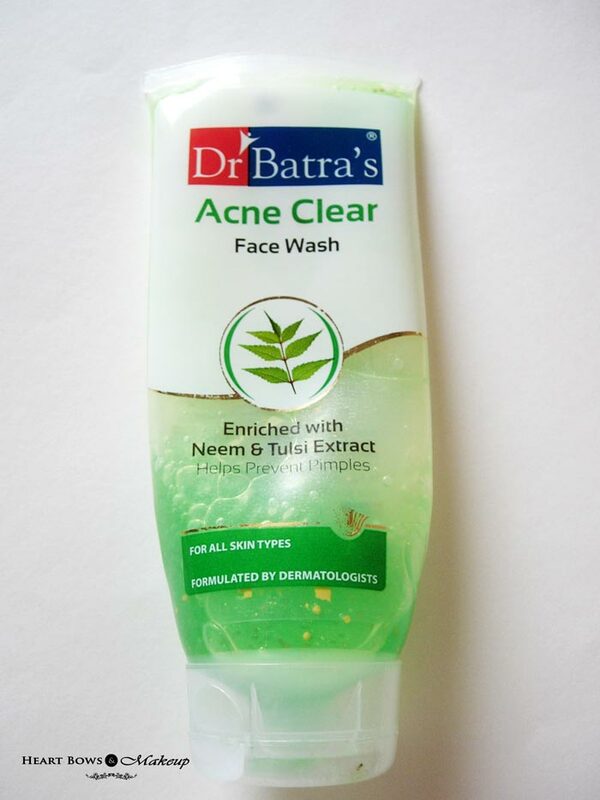 Sulphate Free, Silicone Free, Soap Free – Dr.Batra’s Acne Clear Face Wash is safe and skin friendly. It is enriched with Neem and Tulsi. Neem is proven to have anti bacterial and anti-microbial activity which kills germs causing pimple. Tulsi has anti-bacterial and anti-septic properties which help to heal scars caused by pimples. Neem and tulsi also work as an ideal skin purifying agents to provide healthy and natural skin. 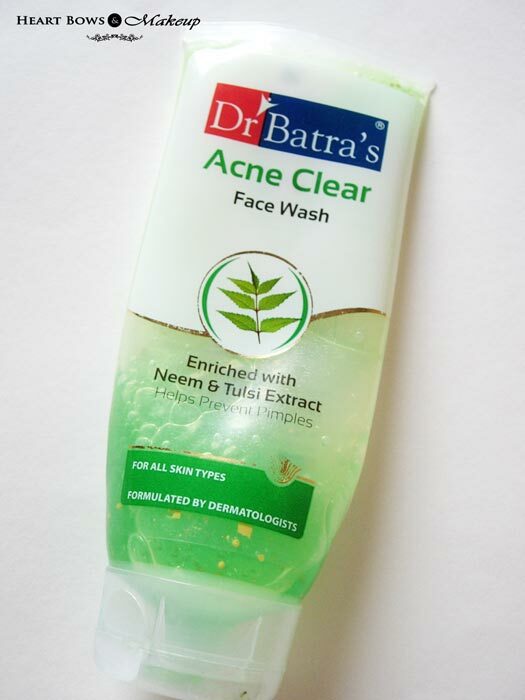 The Dr. Batra’s Acne Clear Face Wash comes in a simple, transparent, plastic tube packaging with a flip-open cap. The transparent tube helps to easily check how much of the face wash is left. The cap shuts tightly and can be carried around while travelling without any fear of spillage. But it is a little bulky to be carried in an office handbag everyday. I wish Dr.Batra’s come up with travel-sized versions also. lot of tiny, yellow beads. Initially, I thought them to be those fancy plastic beads which I used to hate as they basically do nothing for the skin and pollute the environment too. But on using it, I realized they were actually tiny turmeric granules which dissolve on rubbing. The fragrance is mild and pleasant and won’t bother those with a sensitive nose. I have been using the Dr. Batra’s Face Wash for the past three weeks and I am in love with it. I just take a coin sized amount and massage it all over my face and neck. It doesn’t lather much as it is an SLS free face wash, so those who like to foam up their face washes might not like it. But since I prefer soap-free face washes that are mild and gentle, this is perfect for me. The tiny, turmeric granules are very useful and I gently massage them on my acne and pimple marks. It gets washed off easily without leaving any residue. The Dr. Batra’s Tulsi Neem & Tulsi Face Wash cleanses the face effectively, removing all dirt, grime and oil. Unlike other acne face washes with salicylic acid, this doesn’t dry out my face. I didn’t experience the dry, stretchy feeling that I usually do when I wash my face. Instead, my face feels healthy and refreshed with a natural glow. Regarding the acne claims, it doesn’t actually prevent pimples as I had few breakouts even while using it regularly. But it does help to subdue and calm them quickly. This is definitely the best and affordable face wash for oily & acne prone skin. 2) Doesn’t dry out the skin. 4) Sulphate free, silicone free and soap free. 5) Helps to subdue new pimples and breakouts quickly. 6) Enriched with natural, skin friendly ingredients like neem and tulsi. 8) Suitable for all skin types. granules which help to calm down breakouts while effectively removing dirt & grime. 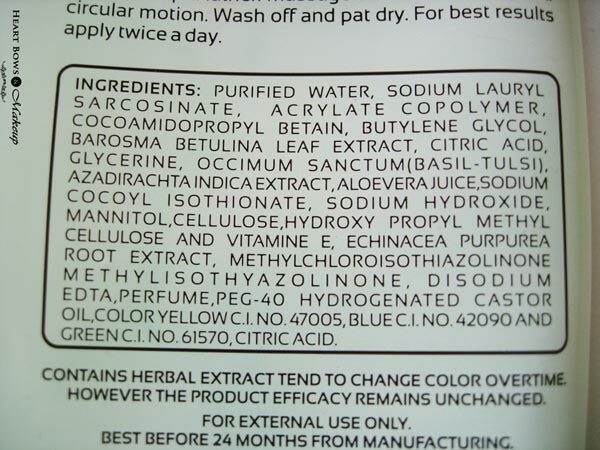 It doesn’t dry out the skin like other face washes which contain salicylic acid. Skin is cleansed and hydrated with a healthy glow.